Well, once again, nature has turned harsh and ugly. So much for Transcendentalism. My publisher (Pelican Publishing) and many of my friends are along the coast. I hope the storm fizzles out. Seeing Cameron Parish this summer depressed me–even so long after Rita. Michele, my good friend and now staff writer for the Assumption Parish newspaper, should have much to write about after the storm is over. 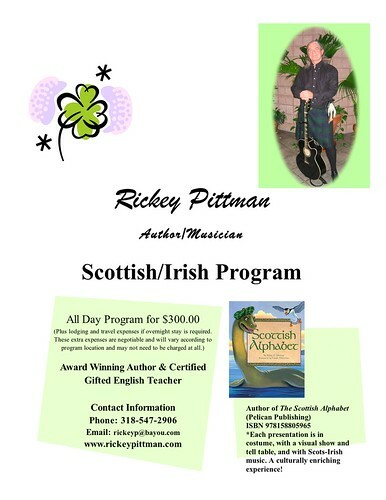 Here is my flyer (flier is less correct alternate spelling) I use for my Scottish-Irish (Scots-Irish) school programs. Feel free to copy it and send it to librarians or teachers who may be interested in booking me. I love to travel, so I’ll go anywhere. Since my children’s picture book, The Scottish Alphabet, came out, this program is popular now, as well as my Civil War and Texas History program.